Born to Presbyterian missionaries in China, Sophia Lyon's family returned to America when she was a young girl. She graduated with a B.A. from Wooster College (1897), took the M.A. at Teachers College, Columbia University (1904), and graduated with a B.D. from Union (1926). With Mary Ely Lyman, she became one of the first women faculty members at Union in 1927 as Instructor in Religious Education. She was also principal of the Union School of Religion in the building that is now part of Teachers College for the last three years of its operation, and a Sunday school teacher at Riverside Church. 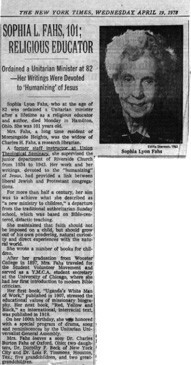 Sophia Lyon Fahs was frequently the subject of controversy due to her approach to teaching children about the Bible. She left Union in 1944 to become editor of Parents Magazine and of children's material for the American Unitarian Association, and editor of the Association's Beacon Series of educational books. She became the first woman professor to be ordained to the Unitarian-Universallist ministry in 1959 at the age of 82. She continued to write, edit, and teach for the rest of her life. She died at age 101 in 1977. 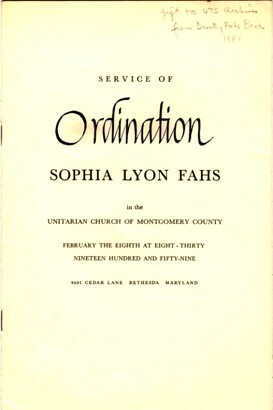 Sophia Lyon Fahs was the author or co-author of over 40 books and even more articles. Her most famous book, Uganda's White Man of Work is a theological/anthropological argument for inter-cultural dialogue and racial reconciliation -- using her experience as an educator in Uganda as an example for effective dialogue. Her main emphasis as an author was this kind of experiential learning. 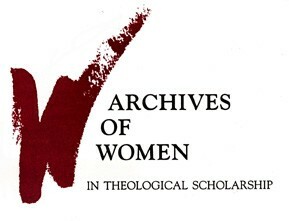 Many of her other works are not biblical exegesis per se, but Fahs's passion was teaching the Bible to children and much of her work is an elaboration around that theme. She was an ardent proponent of teaching children to discover biblical texts and their own spiritual witness for themselves, an approach that drew much negative attention to her. On display at The Burke Library are two books co-authored by Fahs and published in the Beacon series: The Drama of Ancient Israel and The Beginning of Life and Death, as well as her B.D. thesis (based on her experiences as Union School of Religion's principal). Sophia Fahs was embroiled in controversy concerning her teaching methods and views about religious education for young children. Union received a letter in 1936 from a concerned alumna who had attended a class taught by Fahs during the summer and was outraged at what she had experienced. The alumna/student objected quite strongly to students learning about the Bible or the humanity of Jesus before adolescence, as Fahs's students were. Furthermore, Fahs tried to teach her students to place the Bible in its context—to be critical of the Bible as a holy book and of the biblical texts. Perhaps most abhorrent to the objector was the idea that Fahs encouraged young children to think for themselves about what religion or spirituality might mean to them. Nevertheless, one protest letter led to the review and censure of Sophia Fahs by Riverside Church and Union Seminary. She was restricted to teach one class per year and her position was threatened. She forbade the Seminary from telling the faculty, as the administration was going to, that the reason for her demotion was that the funding for her job was cut. In a response letter to the administration, she stated that they should be honest, in fairness to her and to the faculty, and state that they were in disagreement with her views on religious education. She departed from Union in 1944. 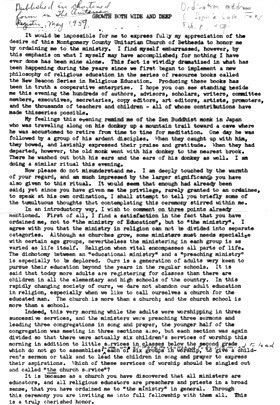 First page of inaugural sermon.